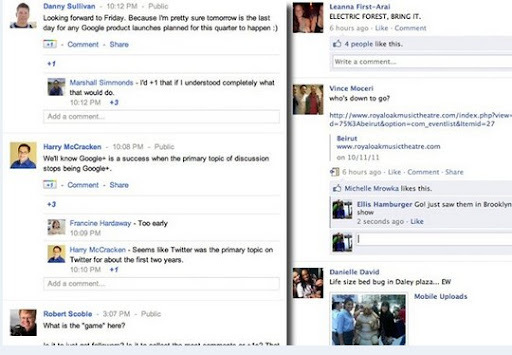 Google Plus vs. Facebook : Similarities, Differences - Should Facebook be Afraid of Google+? Today, Google launched a service that's obviously made to take on Facebook. Currently in test mode, The Google+ Project aims to bring Circles, Sparks, Huddle, Hangouts and other social networking features to millions of Google users worldwide. Circles are social groups largely similar to those we can find on Facebook. 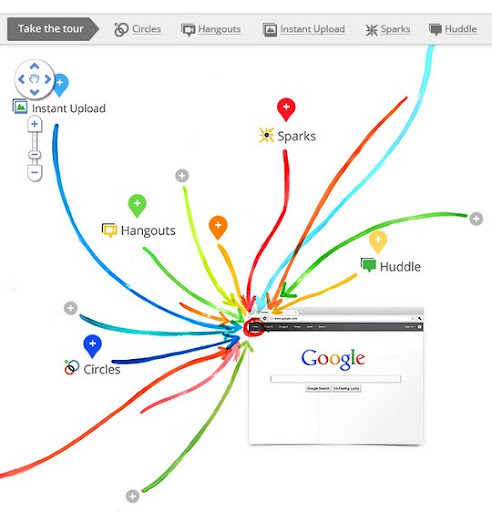 Sparks is basically a search engine for shared content between Google+ users. Huddle, on the other hand, is a group messaging app for Circles while Hangouts is a group video chat app designed to be shared by up to 10 users. Learn more about Google Plus via The Official Google Blog. Apparently, Google+'s interface bears a lot of similarities with that of Facebook. In fact, earlier, Business Insider published an article on the "10 Ways Google+ Just Copied Facebook" complete with screen grabs. Click on the link to see what those are exactly. How are they NOT alike? 1. Google+ Circles is supposed to be better than Facebook groups or lists because it focuses on targeted sharing. So for example, if you want to post a status update that you only want your "siblings" to see, you can just go directly to your Siblings Circle and post it there instead of using privacy screens and hiding the post from certain people. Also, the interface uses HTML5, which allows users to simply drag and drop friends into Circles. 2. Obviously there's no built-in Group Video Chat feature on Facebook just yet. You get that on Google+ via Hangouts app. 3. Google is a Search company and it's bringing its expertise to the Google+ project. Sparks gathers and delivers feeds of great content from the web on your interests, which you can then share with your friends. So for example, you can search Sparks for the latest in Photography and share the Spark or the content that interests you with your Photography Circle. Should Facebook be Afraid of Google+? 1. Facebook is already established as THE Social Network. 2. A lot of elements in Google+'s interface were clearly 'inspired' by Facebook and this can make Google+ feel redundant. 3. Just like that, Facebook can release new features similar to or better than what Google+ is offering. -- it would be easy to say that Facebook has absolutely no reason to be afraid of Google+. Then again, if there's one company in the world right now that can take on Facebook and possibly bring it down, it's Google -- undeniably. I think Facebook shouldn't be afraid of Google+. But FB shouldn't take it lightly either. After all, what good will it do a company to take its eyes off its competition? hi friend how r u? the only difference of this one over facebook is the Hangouts other than that everything seems to be the same. Let us expect that facebook will also launch this app one of this days. The one I see on my yahoomail homepage kinda looks like these two, too. I like the concept of circles since I have my Facebook Friends categorize I still can't have the option to make a private message directly to them through my wall. That's very clever Google.